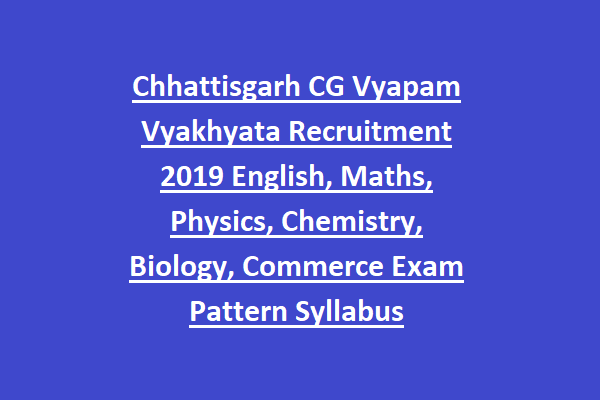 qualified PG with B.Ed they are only eligible to apply online for this Vyakhyata jobs in Chhattisgarh Vyapam vacancies recruitment 2019. Written Exam will be conducted for this CG Vyapam Vyakhyata Recruitment 2019. In this notification we are providing the Exam syllabus for Vyakhyata posts subject wise. 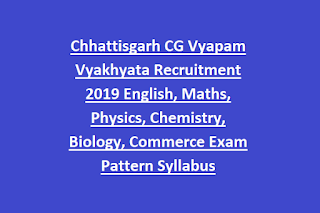 Detailed information about this CG Vyapam Vyakhyata Recruitment Notification 2019 online application form, Subject wise exam syllabus, qualifications and other details are updated below. There are total 3177 Vyakhyata Jobs in this CG Vyapam Recruitment 2019. Department Name: Subject Wise vacancies are given below. As on 01-01-2019 age limits for Vyakhyata jobs is 21-35 years. Age limits are applicable for reserved candidates as per CG Vyapam Norms. MA or M.Sc in respective subject along with B.Ed and TET qualification is required to apply online for this Vyakhyata vacancies of School Education Dept of Chhattisgarh. Candidates selection for this CG Govt Schools Lecturer jobs is on basis of written exam and documents verification. Written exam for this CG Vyapam Vyakhyata jobs will be conducted for 150 Marks and exam duration is two hours. For this Vyakyata posts 20 questions will given from general topcis, 30 questions from teaching methodology and 100 questions from Subject related. Apply online from 16-04-2019 to 12-05-2019. Official website to apply online www.cgvyapam.choice.gov.in for this Vyakhyata Recruitment of Chhattisgarh state govt schools.